I love when I can end my beauty year with a product that truly impresses me, and you'll love it to. 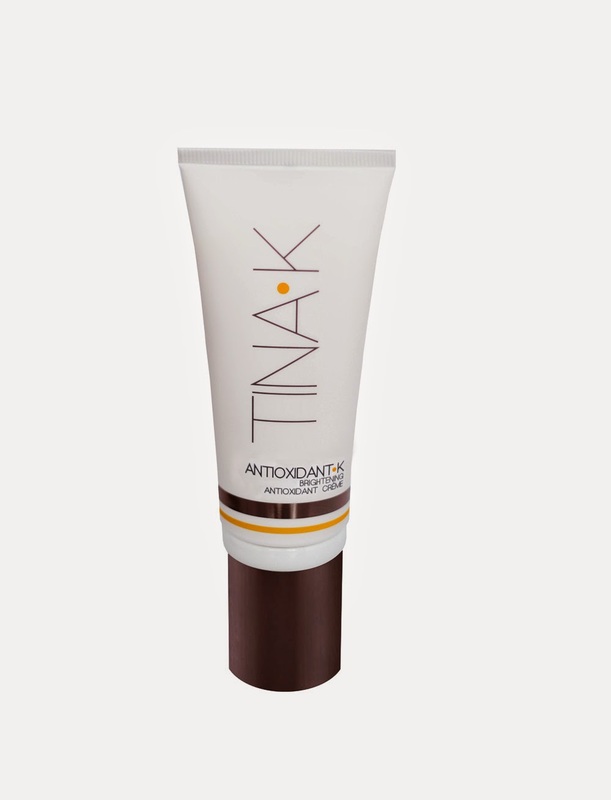 Tina K Antioxidant K Brightening Antioxidant Creme is from the Los Angeles-based skin care line founded by it's namesake, esthetician, Tina K. She created her products because she believed strongly in sunscreen, but feared that many of her clients were not getting enough Vitamin D, which occurs naturally from the sun. So she set about creating a powerful ingredient that could be added to all her products, called Reflect-K. Within her proprietary blend, it acts as both a shield to indoor and outdoor damaging light, helps reduce fine lines and wrinkles, and also mimics the effects of Vitamin D to smooth, tone and tighten skin. At first, I was skeptical as to how this product would feel, with all the shielding properties, but I was pleasantly surprised! The texture is more like that of a thick, smooth serum. It felt lightweight and silky on my skin, and upon first applying, it did in fact, feel like I was putting a thin layer of a :mask" on my face - but then, just as suddenly the cream absorbed completely into my skin, with no trace of residue or stickiness. The cream dried completely clear and there was no white or grey cast to my skin. My skin felt completely hydrated and baby soft smooth, but my more oily areas were not overly shiny. After several weeks of use, I was very impressed with the tone, texture and evenness in color of my skin.. The finish is semi matte, and there's no major fragrance in it. I also found it an excellent substitute for a primer, as it left the surface of my skin completely smooth to begin applying my makeup. This product does have a luxury price tag, but it's quite concentrated (I only needed 1 pump per application), and with the advanced technology behind it, and of course, the results - it's worth it. *This product was provided courtesy of Tina K PR for reviewing purposes.